In Birds in Brazil, Helmut Sick says that "the trogons are a small group with splendid plumage, worthy of symbolizing the exuberance of the tropics. Well represented in the Neotropics (especially in Central America), they also occur in Africa and the Oriental region, although in reduced diversity. Their appearance is distinctive, and their phylogenetic relationships are obscure." One could hardly say it better (and that is translated from Portuguese!). Almost half of the family is in the familiar genus Trogon, like this west Mexican thorn-forest endemic Citreoline Trogon (male; left). Trogons are either citrus-bellied (lemon or orange) or red-bellied, and it just happens that my best photos are of yellow-bellied species. Males have much richer plumage above, with shimmering greens and blues predominating, while females tend to be clothed in more somber tones. Undertail patterns typically differ between the sexes, and males use their flashier patterns in courtship. 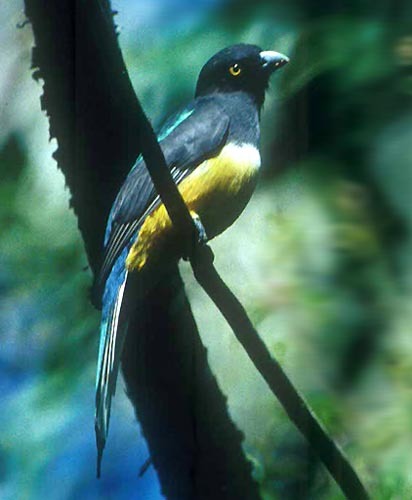 Trogons are birds of the forest, ranging from humid lowlands to mountain cloud forests. Although splendidly colored, they are much easier to hear than to see. Their hollow hoots have a ventriloquial quality, and it can be very hard to locate a perched bird until it moves. Trogons live in pairs or solitarily, scanning the foliage for caterpillars and other largish arthropods, snatching these prey from leaves or limbs by hovering. At other times they fly-catch with short sallies, or visit fruiting trees. The bill is broad and surrounded by bristles (recalling nightjars). The neck is short and the eyes large (with eyelids and eyelashes); I suspect that large dark eyes help find food in the interior of dark woodlands. Although New World trogons are quite wonderful, perhaps the most gorgeous colors are sported by a few Old World species, and none is more striking than Whitehead's Trogon of Mt. Kinabalu, Borneo (right; © Paul Huang). I missed this montane Bornean endemic during my first visit; I surely hope to see it in my next! My globe traveling friends Bill & Mary Rydell tell me that it is just heart stopping in the field. Paul Huang's incredible shot here (used with permission) is part of his gallery of photos from Mt. Kinabalu , highly recommended. The Old World trogons (three species in Africa, eleven in Asia) seem inordinately difficult to see in dense primary forest (e.g., we spent an hour trying to glimpse a calling Bare-cheeked Trogon Apaloderma aequatoriale in Gabon). I have been especially impressed by the beauty of the trogons of Borneo and the Philippines. 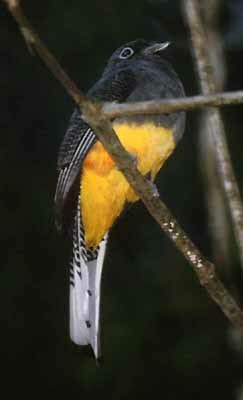 If you wish to check out some really spectacular plumages in New World trogons, look at a Caribbean field guide or Collar (2001) for Cuban Trogon Priotelus temmurus and the Hispaniola Trogon P. roseigaster. I've seen the latter in the mountains of the Dominican Republic, and it takes your breath away when it first comes into view. My friend Karl Overman got this shot of the Cuban Trogon ( below left ), a single island endemic. Trogon photography can be difficult in the deep forest; I used a flash to take this shot of the widespread White-tailed Trogon (Panama through the Amazon Basin; this is a female; below right ). Many species of trogons nest in abandoned termite mounds (some typically create their own burrows), holes in rotting dead trees, or thick tree-fern trunks. Only one species regularly reaches the United States (the Elegant Trogon Trogon elegans, best known from southeast Arizona) and it is therefore highly sought among less-exotic American birds, but the superb vagrant that occasionally reaches us from n. Mexico -- the Eared Trogon Euptilotis neoxenus -- is a real prize. 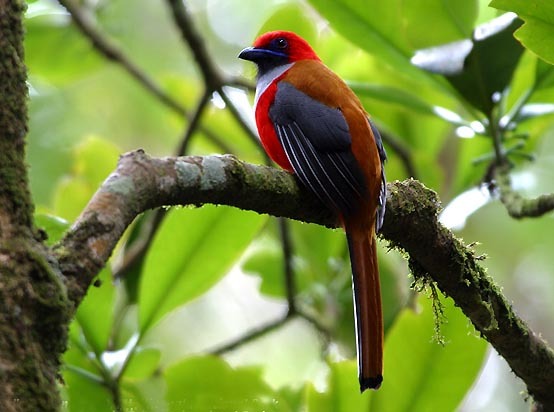 Not only is it lovely and rare, but it has loud, raucous, memorably and totally un-trogon-like calls. The most spectacular of the Trogon family are the five species of quetzal (genus Pharomachrus ), and the most famous is the Resplendent Quetzal (below; both shots) of Central America. The male has one of the longest tails (actually modified uppertail coverts) in the world. My photos are not that great, but you can see the long green trains extending from the tip of the white undertail down to almost the bottom of the left-hand shot; in the right-hand photo the male is peering from a nest hole atop El Triunfo volcano, Chiapas, Mexico. Most of the time one could only see the long tail streamers. The Resplendent Quetzal was considered sacred to the Mayans and Aztecs, and is now found on the Guatemalan coat-of-arms and flag. It is a sedate bird of "damp, epiphyte-laden mountain forests, frequenting canopy and edges" (Stiles & Skutch 1989). It was certainly a major highlight of my three visits into its cloud-forest habitat: at El Triunfo; at Monteverde reserve, Costa Rica; and in the Chiriqui Highlands of western Panama (thus I've visited both ends and the middle of its range). Despite the spectacular plumage, individuals are difficult to see but, should any ray of sunlight hit the glistening green plumage, they shine. Photos : The male Citreoline Trogon Trogon citreolus was at San Blas, Nayarit, Mexico, on 26 Feb 1987. Paul Huang photographed the Whitehead's Trogon Harpactes whiteheadi on Mt. Kinabalu, Sabah, Malaysia, in the early 2000s. 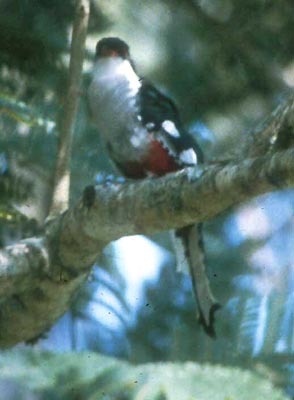 Karl Overman managed the shot of Cuban Trogon Priotelus temmurus at Soroa, Cuba, in May 1982. The female White-tailed Trogon T. viridis was along Pipeline Road, Canal Zone, Panama, in Jan 1981. The first Resplendent Quetzal Pharomachrus mocinno was on Cerro Punta, Chiriqui, Panama, on 22 Jan 1981; the second was at a nest site at El Triunfo, Chiapas, Mexico, in March 2003. All photos are © 2003 Don Roberson, except that attributed to © Paul Huang, used with permission; all rights reserved. 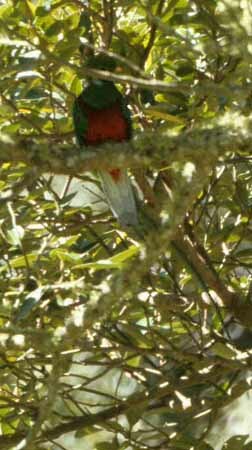 Family Book : There is a recent (2000) Paul Johnsgard book on the Trogons and Quetzals of the World ; I have not seen it. The family is now well-covered by Collar (2001) in the Handbook of the Birds of the World series. That family account includes some stunning photos of quetzals but some of the trogon shots are not up to their usual standards. Paul Huang's Whitehead's Trogon photos on this page (and another on his web site ) are much better than the HBW choice. My own photo of Citreoline Trogon (shown at the top of this page) is also in the HBW family account but, oddly, they published it full-frame rather than cropped (as on this page). Collar, N.J. 2001. Family Trogonidae (Trogons), pp. 80-129 in Handbook of the Birds of the World, Vol. 6 (J. del Hoyo, A. Elliott & J. Sargatal, eds.). Lynx Edicions, Barcelona, Spain. Sick, H. 1993. Birds in Brazil: A Natural History. Translated from Portuguese by W. Belton. Princeton Univ. Press, Princeton, N.J.
Stiles, F.G., and A.F. Skutch. 1989. A Guide to the Birds of Costa Rica. Cornell Univ. Press, Ithaca, N.Y.